Standard Bunk: $2100 per person; includes all meals. 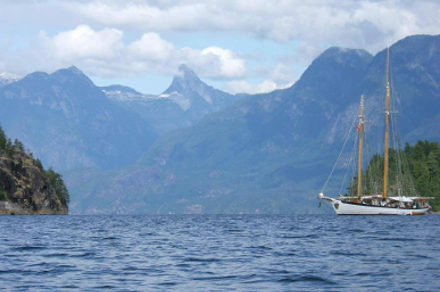 The voyage to Desolation Sound is the Schooner Zodiac’s ultimate adventure. Join the crew for a 10-day, 9-night expedition to one of the most beautiful and isolated destinations in North America. Your odyssey will depart from Bellingham, Washington and check into Customs at Bedwell Harbor on South Pender Island in British Columbia. 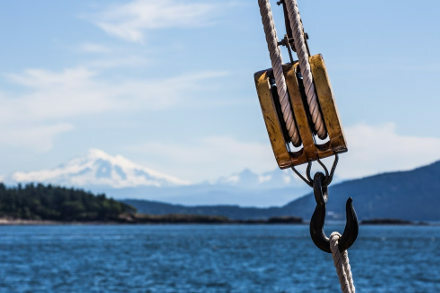 Once free to explore the Canadian Salish Sea we will dock in Ganges on Salt Spring Island. There passengers can venture ashore to explore and get their last taste of civilization for the remainder of the cruise. The Zodiac will sail north through the Canadian Gulf Islands and up the Strait of Georgia along the east coast of Vancouver Island. Throughout the trip, our crew will arrange group activities. These include, film screenings, seminars on maritime topics, scavenger hunts, costume parties, talent shows and on-deck BBQs all designed to maintain a fun on-board community. Desolation Sound sits at the north end of Canada’s Sunshine Coast. Many yachters and sailors regard this area as some of the best saltwater cruising ground in the world. Steep evergreen mountains, all teeming with native North American wildlife, surround the pristine waters of Desolation Sound. One of the prime attractions in these waters is their warmth in summer months, which makes them ideal for swimming, kayaking and snorkeling. “A great experience a total hands on sailing adventure get to learn a lot of different aspects of sailing, hoisting and furling up the sails, taking the helm and standing watches while at sea sailing. The food is second to none all very well prepared and thought out. Lots to do too while at anchor, kayaking, sailing and swimming when possible, also able to learn some knot tying and rope know how..Take your cameras as you will be treated to spectacular scenery and might even catch some whale watching while your are at it. I do plan to go back. Had my first oysters on this trip cooked of course. It is a very entertaining trip.